Still working on finishing touches but nearing the end of a multi-year project to move into the "Corner Bank", the Collinsville Chamber of Commerce held an open house Dec. 8th, 2005. 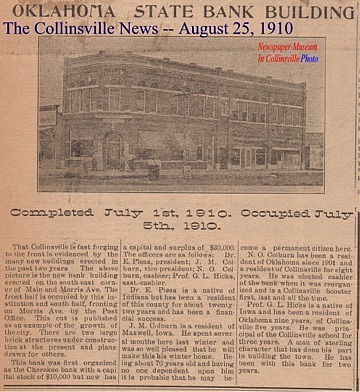 The new home of the Chamber of Commerce was built in 1910 and first occupied by the Oklahoma State Bank. 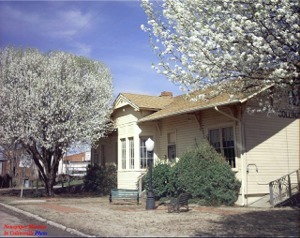 The old (but likely not original) windows were removed and replaced in November 2004. 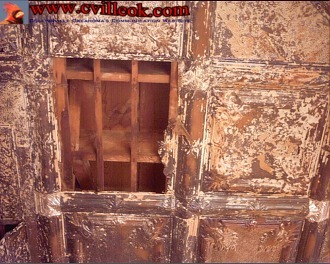 The metal ceiling has been cleaned and patched since the Oct. 2004 photo below. 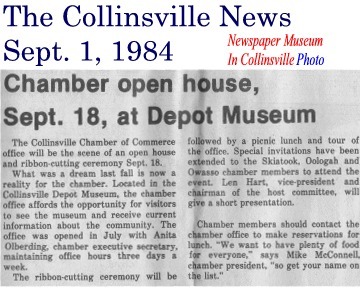 The 2003 photo above shows the previous home of the Collinsville Chamber of Commerce since the 1984 open house below. The Chamber will hold their annual banquet Jan. 28, 2006 and the new officers will be installed. The Chamber sponsored Christmas parade will be this Saturday Dec. 10th at 11am.